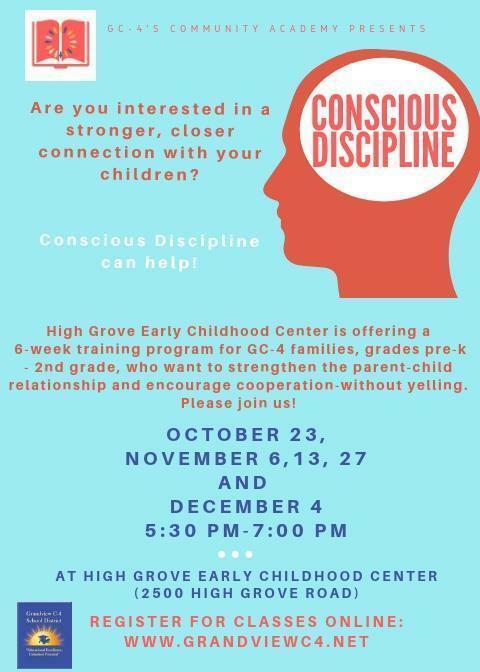 Community Academy along with High Grove Early Childhood Center are partnering up to offer Conscious Discipline Classes! The class is a 6-week training program for GC-4 families, grades pre-k- 2nd grade, who want to strengthen the parent-child relationship and encourage cooperation-without yelling. Please join us October 23, November 6, 13, 27 and December 4. For questions or more information, you may call Pupil Services at 316-5037.